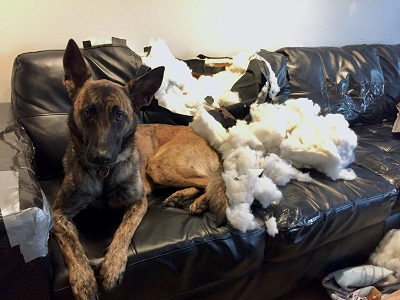 I wanted to get some input from people that truly know Dutch Shepherds and see what you think. I've attached a few pictures of our new family member, Lola. We adopted her a few weeks ago and the rescue had her listed as an "Australian Shepherd / Golden Retriever" mix. We have an Australian shepherd as well and we're not seeing any of that in her. She was about 10-11 weeks old when we adopted her and at that point her ears were down - but now they're tall and pointy. She was rescued from a kill shelter in the Florida panhandle and that shelter had her down as a shepherd mix. She has some very tiny puffs of white fur: on her chin, in the front of her chest, on the end of a couple paws. She is approximately 20 lbs right now and a little skinny. The color in her brindle started out as a softer, almost golden/orange color, but in the picture with her laying with our Aussie Ezekiel, you can see it has lightened to more of a tan color. She has a bit of inquisitive personality - she will watch TV and follow the characters on the screen with her head. She doesn't like being alone - If someone gets up to leave the room she will follow them with her eyes / head the whole time until they come back - even if she's got someone else in the room with her. We're working with her on training and she seems to be a fast learner. We rescued her to get a friend for Ezekiel, and they're great pals regardless of what breed she is - so we won't be offended if you think she isn't a Dutch Shepherd. I'd love to hear some feedback about what you think she might be if she isn't. Ultimately we're just interested in finding out what she is. If there are better pictures / angles I can provide let me know. Any feedback is appreciated! EDIT: I should also add - she is very vocal. Not so much barking.. but various short whines in different tones... she's starting to grow out of it but at first we were joking that she might be part monkey. appx 11 weeks - ears weren't up yet. Last edited by rabeatz on Wed Jan 10, 2018 10:17 pm, edited 1 time in total. She may be just a little too young to tell at this point, but oh my is she adorable. rabeatz wrote: I should also add - she is very vocal. Not so much barking.. but various short whines in different tones... she's starting to grow out of it but at first we were joking that she might be part monkey. Thanks! She's very cute! Seems like she just figured out barking as she's starting to do it a little bit when she's playing with Ezekiel, where she wasn't before. Chewbacca definitely sounds like a good way to describe it, it's almost like she's trying to talk with the noises - she isn't necessarily upset when she does it. When she wants to play, or when someone new walks into the room, or even when she's just laying in bed and wants to snuggle she'll do it. Her noises are still relatively high pitched - although she has started growling back at tug of war with Ezekiel and her growl is almost as deep as his. She's also VERY fast. With an Australian Shepherd I'm used to a fast dog - but she is all over the place. he's 8 now and perhaps isn't in the best shape because she runs circles around him.. Including inside the house. I'm looking forward to her getting bigger so we can see. What she looks like. I've seen some adult pictures of female Dutch shepherds that are absolutely gorgeous, which is why I'm kind of hoping that she is. I'd say that the ears look like dutch ears from bottom to top, but there's variation within the breed. I hope I can find a path that leads to me getting a dutch puppy eventually. One thing I've noticed with En; if I go a couple days without doing something- even just twenty minutes of obedience and playing food games- it's as is she loses a bit of the respect and formality that she normally displays. You've really got to give them something to do every day. TimL_168 wrote: I'm looking forward to her getting bigger so we can see. What she looks like. I've seen some adult pictures of female Dutch shepherds that are absolutely gorgeous, which is why I'm kind of hoping that she is. Cherish the puppy moments, because your probably in for an exciting ride if she is a DS. That's kinda of a weird hiccup, isn't it? Oh, it's definitely been an exciting ride already. It might be a puppy thing but we're definitely dealing with "crazy hour" - every morning when she gets up and sees Ezekiel again, and usually at least one more time in the day. She looks like my DS puppy looked at that age. I've noticed that as very young puppies you can't tell very well how they will look when they are about 1 year old, especially since the hind legs and the chest grow really fast initially and they may look awkward. The snout is rounder in puppies , but as they grow it starts looking longer and more angulated. The snout did get longer in mine as he grew, as well. The ears may be huge now, but she will grow into them as her head gets bigger. She has longer hair so she may be the long haired variety of DS. She is very pretty. I"ve noticed and read that their brindle color can change a lot as puppies and beyond that. She may become more of a lighter brindle from what I see. My puppy was very dark initially and started getting lighter colors as he aged, other people noticed that too. ralbucks wrote: She looks like my DS puppy looked at that age. I've noticed that as very young puppies you can't tell very well how they will look when they are about 1 year old, especially since the hind legs and the chest grow really fast initially and they may look awkward. The snout is rounder in puppies , but as they grow it starts looking longer and more angulated. The snout did get longer in mine as he grew, as well. The ears may be huge now, but she will grow into them as her head gets bigger. She has longer hair so she may be the long haired variety of DS. She is very pretty. Slightly off topic but I looked at some of your posts - tried to PM you but it doesn't appear to be an option. Did you ever find much info about your DS when you rescued them? I saw your post about wondering how a DS ends up as a stray - and when I started thinking Lola was one, I was wondering the same thing. I saw you adopted him in North/Central Florida. We rescued Lola in Central Florida (Orlando Area), but she was initially in a kill shelter in Chipley, FL, in the panhandle. And when she was there - she had a sibling. The shelter doesn't take any drop-offs, etc, but most of the dogs come from animal control so the majority of their dogs are strays. I found it kind of peculiar that two (potentially) DS puppies were just.. strays. I wonder if there's a breeder in the North FL or Panhandle area that just lets their unwanteds... go? I tried searching and didn't seem to find any breeders in the area. Chipley is about 17 miles south of Alabama so I guess it's possible she wasn't even from FL initially. She isn't the bravest dog - if she hears a bark in the distance and we're in the yard, she will run to the door to go inside, so I could see if someone is breeding them for security that being an undesirable trait. Just a curious thought, because if she is a DS then I don't understand how she and her brother ended up as strays. Attached a picture of her and her brother from the kill shelter's facebook page. Awww, such cute puppies. Does the brother have blue eyes?, I could not see well from the pictures. Well, yes, mine was a stray into animal control, no more information than that. Of course, at the time I had no idea what he was, so I thought I was adopting a goofy puppy which may have gotten lost somehow. However, he was very smart, loving and really wanted to get out of the cage. As for fear, mine is not exactly the most brave, I mean he threw a fit over some balloons when he was smaller. But now he is kinda dominant, very vocal. So let her grow a little and she may overcome the fear. There are many ways to train the dog out of the fear, I'm no expert, but you can look on the forum. 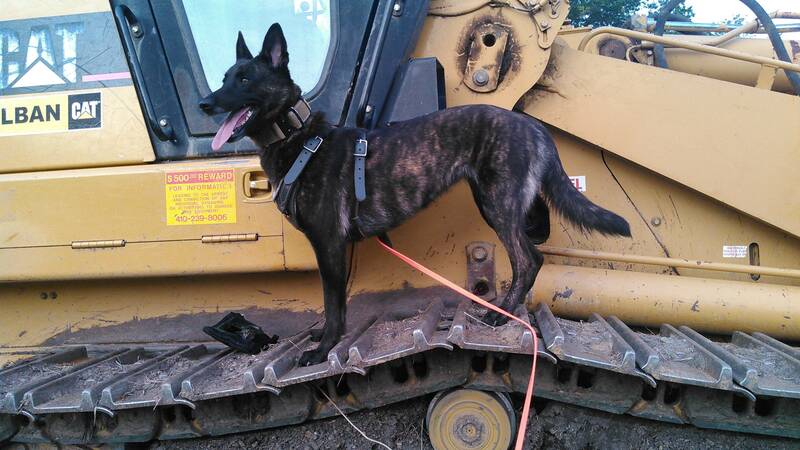 If it does end up that we think she is a Dutch Shepherd - what are the opinions on the subject of training? Is training on your own advised against, or does that kind of depend on the way the dog reacts to the training? I'm not a professional trainer by any means, my experience are just family pets from the past - a german shepherd / chow mix (passed away around 2008), and our current dog Ezekiel, an AKC registered Australian Shepherd (male). I trained Ezekiel myself with positive reinforcement (a clicker) and was hoping to do the same with Lola (have been doing some work with her already). Our goal is to have a family pet - we have our dog Ezekiel, two children (both boys aged 7 and 10), and another on the way in July. Obedience is really the only thing we'd focus on - I don't think that bitework, guarding, etc, will be in our plans at any point, at least in the near future. Tell us about yourself: Over the past 25 years I shared my life with a Rott, two Akitas, and a Shepherd/Husky mix. I now have my first Dutch Shepherd. Lexi was born in early September 2014. She is great in so many different ways but I could use advice from some been there done that DS owners. Thanks for looking at rescue pups. I'm on my fourth rescue which were all very different in personality but each was a blessing in her own way. My first two were pure bred akitas and I just got lucky finding them. Right now I have a shepherd husky mix, dutchie and an Akita mix. I will say my dutchie is by far the smartest dog I've ever owned. You are lucky to have possibly found a dutchie. Maybe next rescue I should look in Florida. I hope she is a blessing to you and your family. She sure is adorable !!! Just figured I would post a new picture since she's a few weeks older. She's continued to be vocal when playing, etc. She also can't seem to resist placing her feet on the top of the tub when I or my wife are in the shower - she acts like she wants to get in, but if you put her in she'll scramble to get out.. quite interesting! We finally made the transition to keeping her in the crate at bedtime as well - wife wanted her on the bed but that stopped after she peed on our comforter. The first few days were rough but now she lays down and goes to sleep as soon as she gets in without complaining. She's continuing to get bigger - about 25 lbs now. Definitely getting longer, too! A quick update - she's about 5 months old now. 35 lbs. Here are some new pictures.. not the best angles but I'll try to get some new ones. She and Ezekiel are best pals - glad she's a part of our family! Thought I would report back since we had a DNA test and got our answer. According to Wisdom Panel 3.0 , which includes the Dutch Shepherd in it's breed list - Lola does not have any Dutch Shepherd at all - to our surprise! Her DNA is 62.5% German Shepherd, 12.5% Boston Terrier, 12.5% American Bulldog, and 12.5% mixed terrier, herding, sporting breeds. Tell us about yourself: I love Shepherds- German, Dutch and Belgian. I recently lost my 16.5 y/o GSD mix and was hoping to find a GSD or DS mix. I totally lucked out in finding Grendel, a DS/GSD mix at 9.5 weeks old. She was filthy and flea-ridden, but still the cutest, craziest thing ever. She's going to live up to her name! First dog I've had that I've actually seen the parents and definitely know what she is! Curious- what does "US Show" mean? That they've actually traced the DNA to a particular registered dog/familial line?? From what I've read I think it means that particular dog in the family history was bred to US show (AKC?) specifications. However, that one also has an asterisk next to it, which means: *Breed detected, however at a lower confidence.